I hope you didn’t think I abandoned any of you. No, I’m back in the world of employment, for a while, anyway, and have been having long days and obstacles. While I don’t want to bore anyone with details, I will say that it could end up meaning I may be cooking in a new kitchen at some point. We’ll see. 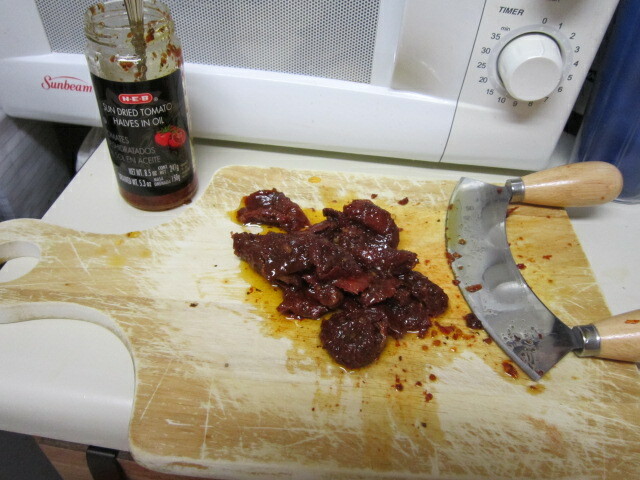 I have a lot to do, and cooking on Sunday has worked for me for the last couple of weeks. I sewed yesterday, and completed two simple garments (one with several buttonholes) and yet another bag. Hey–you gotta be stylish downtown, OK? The Lunch Purse will be in my briefcase and be used on the occasions when I step out to lunch and need to be stylish but don’t need my whole purse, just my wallet and cell phone. I made it into Trader Joe’s again last Sunday, except this was the store on S. Shepherd in Houston, not the one in the elegant Woodlands part of Houston. This store in town has a little less stock, I think, but the cashier told me that they do that to slowly introduce the brand into a new market. Kind of silly, since most people in that part of town know what Trader Joe’s is, just like they do in The Woodlands, since many people in Houston have either traveled to the west coast or moved from there. Since the TJ store in The Woodlands has been there longer, they have more stuff. Well, OK. they had those trimmed fennel bulbs, but I still didn’t get any. I now work downtown and have access to the somewhat famous Houston Downtown Tunnel, and have been walking for 30 minutes every day down there. It’s basically several miles of food court as well as some shops, doctor’s offices and other services thrown in. Love it, and there are three Seattle’s Best Coffee shops down there. THREE! My bud Eddie says that when he worked downtown he spent a lot of time down in the tunnel. I plan to explore the branches of the tunnel when I figure out how to get back to where I need to be. I also want to take trips on the free Greenlink bus, but that’s an after-work thing. Seattle’s Best Coffee disappeared from the rest of Houston a couple of years ago when Borders closed up, except for a couple of freestanding stores inside the 610 loop and the tunnel. Note: it’s not safe to crack jokes to police officers in Seattle’s Best at 7:45 in the morning. Now for the news: recent article in the esteemed Wall Street Journal discussed something that has become one of my favorites recently, hummus. Not just any hummus, but this recipe from Real Simple a few years ago, and I’ve been making it ever since. I think I’ve written about it before, but the difference is that I halve the amount of lemon juice, because what they suggest absolutely screams lemon. Yuck–kills the taste of the sesame and chickpeas. But no, this article discusses the, um, spreading in popularity of this staple of Middle Eastern countries. Oh, I feel the puns coming. 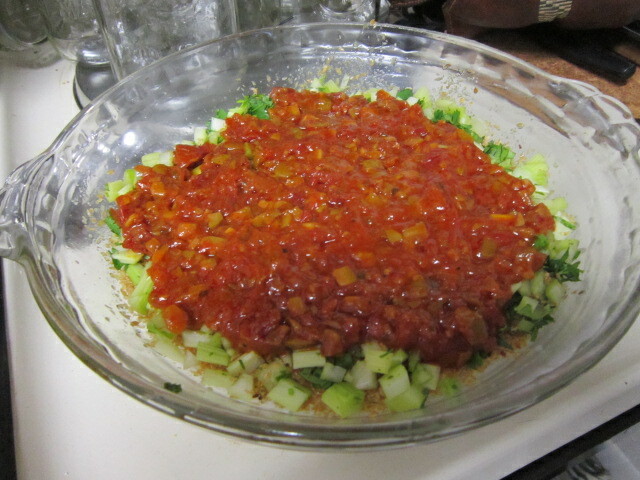 Look out. . . .
Hmmm. . .red pepper hummus, which has a big dollop of pureed red bell pepper right on top. They have snack sizes with pretzels, too, and differently flavored types, which aren’t exactly Middle Eastern, as pointed out in this second WSJ article, because slightly weird comedian Stephen Colbert complained about it. Remember that this is the same comedian who a) got a treadmill named after him that ended up on the International Space Station, and had astronaut Sunni Williams announce it on his show, and b) tried to get a Washington, DC toilet named after him. BTW, chickpeas are also called garbanzo beans, a term I actually like better. Dunno why. So I’m going to quit using the former term and use the latter one. Garbanzo. So because hummus is spreading in popularity, the Sabra company is looking to spread out their growing operations to get more garbanzos to make the hummus with, including contacting tobacco farmers. Cool! I’m not a fan of cigarettes, (I’ve never smoked) and it could help farmers make the switch if they want to (their choice, of course.) One farmer didn’t know what they were and at 71, actually tasted garbanzos for the first time–and liked them. We’re on the right track. Anyway, the focus of the article is the Sabra company which is gaining in popularity after handing out samples all over the US. I like that recipe I gave you, and will eat it with celery or in a small bowl with a spoon, but I thought I might check out Sabra in my weekly visit to the League City SuperTarget. Found it! 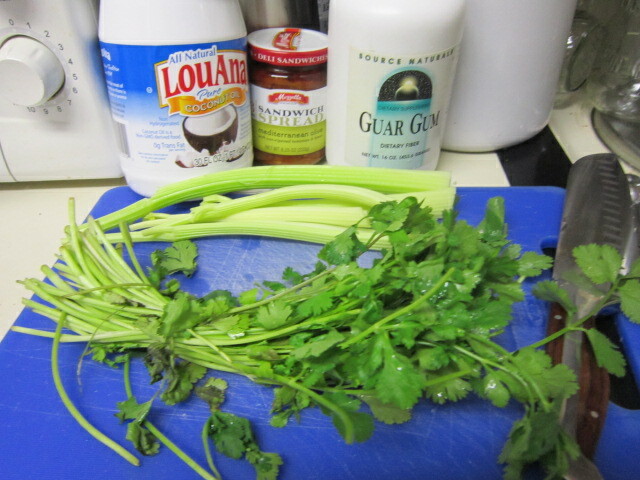 Right with the fancy salad ingredients and fresh herbs. I pick up the container, and looked at what they used to make it. You wanna try it, you’re on your own. I do NOT DO SOYBEAN OIL. Anyway. . .garbanzos are a bit of a pain to deal with dry, so I suggest buying the canned grocery store brand and rinsing them yourself in a colander, removing any loose skins you might find if you want to. Today I went to my local HEB and bought two more cans. I can’t put my hands on my grocery receipt, but I think they’re 69 cents a can; Target is about 82 cents for their Market Pantry brand. So what else have I been up to? Well. . .as I did last weekend, I cooked up a storm and will be re-running the dishwasher soon as I finish telling you, then ironing for the week. In addition to roasting some turkey thighs and two packts of thick pork chops that were on sale at SuperTarget today, I made a batch of my favorite Yeast Free Brownies and a gluten-free, yeast free breakfast quiche by literally throwing a few things together. 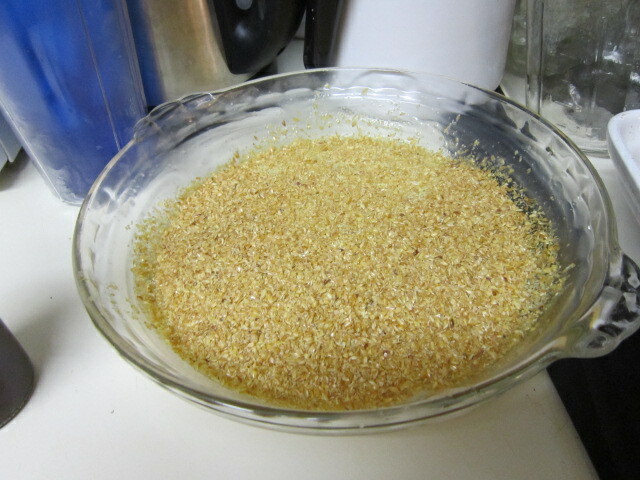 Without cream or milk, I was somewhat limited in what I could use for a binder for the eggs, so I tried guar gum. 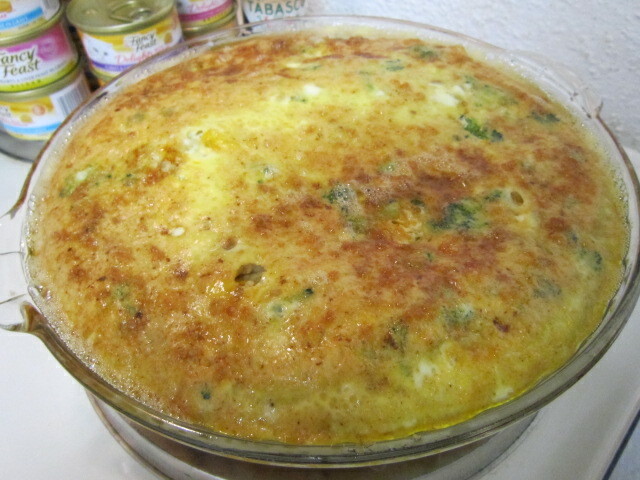 Mixed up 10 eggs with the ill-advised guar gum, and baked it for, um, I don’t know how long. I just watched it and when it was done, took it out. That was it. This week, I wanted to make it again, and went shopping. I got more eggs and stuff, and went looking for that Mezetta sandwich spread. I’ve seen this stuff for years and never paid any attention to it. Never did find it. After thinking about how to try and make this week’s similar, I got some sun-dried tomatoes in olive oil, a bag of frozen chopped broccoli and put that together. Gotta be good, right? Yes, I have one of those curvy knives like Nigella Lawson. And unlike Nigella Lawson, right after I took that picture, the cutting board slipped and four tomatoes went on the floor. AAAAHHH!!!! But I still had plenty. Last week’s was pretty good, but it needed salt. Let’s see what this one tastes like. No, the cat food is just on the stove for my convenience. It only goes into Jezebel’s food bowl, not mine. However, I once implied to my mother that I was eating cat food. . .”with crackers late at night, it’s pretty good!” She believed it for half a nanosecond. It’s all about getting ready to head out the door by 6:56 to catch either the 6:55 or 7:03 am bus into downtown. This helps a lot. I’ll keep looking for good recipes that don’t involve milk or cream to blend with the eggs, too. 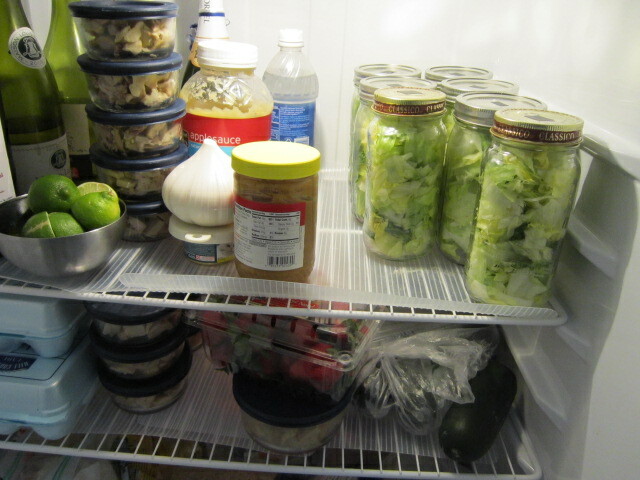 How about a peek inside the fridge of the Heatcagekitchen? He was someone’s inside kitty, until someone moved away and left him and two brothers locked in a unit. When they were found, they were set loose and lived outside for a while. 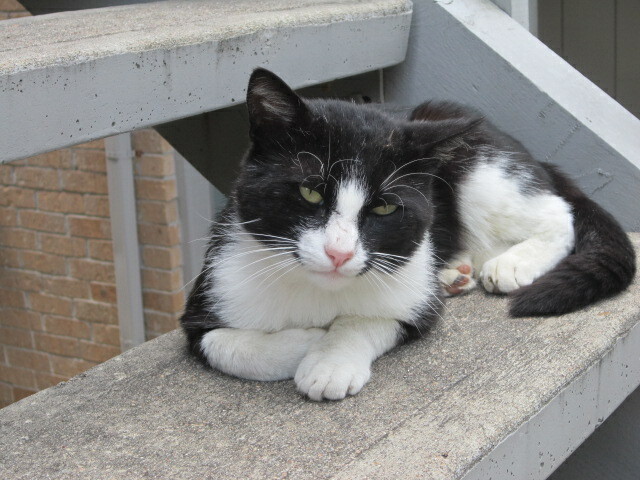 Two have been adopted, but this guy has been a freelancer, getting fed by a few folks and enjoying life on the lam. He’s not feral, but I can’t take him in, since I’ve got one step kitty and he needs fixin’. And shots. (And a bath!) Out of my range right now. We call him Jojo, but we don’t actually know what his name is. He’s friendly til you do something he doesn’t like. Otherwise he’s pretty happy. Well, folks, the dishwasher has finished its first go round, and I need to empty, refill, and re-start it before I go iron something to wear to town tomorrow. I’ll try to post again soon and not wait too long. Fast & Easy,Special considerations,Tricks of the trade,What's for Dinner?